In 1933, Cornelia van Asch van Wyck, the Dutch president of the World YWCA, came for a visit and earned MBS’s admiration for the sophistication of her worldview. “I don’t think I have ever met any one before with a really international outlook”, wrote MBS to her parents. “Most broadminded Americans are internationally minded only to the extent of having a benevolent tolerance towards Europeans and Orientals and looking forward to the happy day when all the world will have come around to America’s way of doing things. 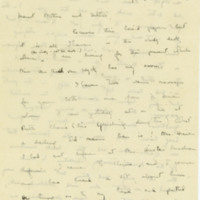 But Miss van Asch van Wyck never discounts any one nation’s difficulties or idiosyncrasies and assumes from the beginning that both sides (not just the other fellow) will have to make adjustments and that these adjustments will not be easy.” This was an uncommon view, perhaps ahead of its time. Miss van Asch van Wyck exemplified a philosophy of inclusion, compromise, and respect that MBS had already begun to demonstrate as well. 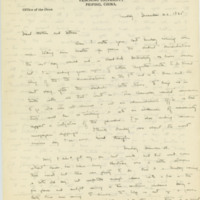 In 1929 she had reported to her parents on the most recent Mission Meeting, and expressed a wish for more Chinese voices to be included in the important decisions being made—especially the ones that affected so many Chinese workers in Mission-run churches, schools, and hospitals. “I was very much struck by the great difference in attitude in Paotingfu + Shuntehfu, as compared with Yenching, toward the question of Chinese cooperation. Here in the University it is not a “question” at all; it is the natural order of things, and no one thinks anything about it. It is a much happier atmosphere to live in here where foreigners and Chinese are all on the same social, intellectual, and economic level… I wonder if it is ever possible for a foreigner to work almost entirely among uneducated people without feeling patronizing and somewhat set apart, no matter how much he may ‘love’ them.” Many of MBS’s experiences negotiating the culture gap (or, what she referred to in a 1935 letter as the “yawning psychological gulf”) ended in frustration or discouragement, though seemingly never without a renewal of her efforts. 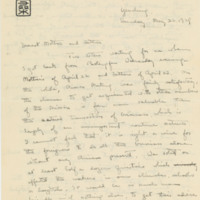 All letters referred to in text are shown on this page, in addition to several other relevant letters and a selection of images that show MBS’s experience as a foreigner in Yenching.